The Lynn Plantation offers couples a private, three-course, romantic dining experience in Belcher. The Lynn Plantation Home is a repurposed residence that blends preserved history and modern decor, located at 11569 Highway 3049 between Belcher and Gilliam. It operates as a venue space for weddings, receptions, baby showers, tea parties, birthday celebrations, banquets, brunch meetings, and now, romantic dining experiences. Lynn Plantation and Events offers couples the opportunity to privately dine inside or on the lawn of the historical Lynn Plantation Home. This experience includes a three-course meal with wine or champagne in the ultimate romantic setting that includes soft music, candles, and elegant table décor. This meal includes a starter salad, entrée and dessert. Dinner is prepared by one of the following options: an in-house cook, a list of suggested chefs and caterers provided by Lynn Plantation Events, or romantic diners can choose their own preferred caterer. A popular meal prepared by in-house cook and Lynn Plantation Home owner, Steve Campbell, includes a spinach salad with prosciutto and cantaloupe morsels dressed with a homemade red wine vinaigrette. An entrée of pan seared lamb chops and sweet potato stacks resting in a caramelized walnut yam sauce. For dessert, Campbell often serves a hefty slice of orange cream cake for the couple to share. Built in the late 1800’s, The Lynn Plantation Home primarily serves as a venue space, it carries a deep rooted history of north Louisiana. Its original owners were the Cavett Family until 1918, when it was purchased by the Lynn Family. The Lynn Family developed the home into a fully functioning plantation that expanded the crop to more than 2,000 acres. Campbell was the first to own the home outside of the Lynn Family after nearly a century. 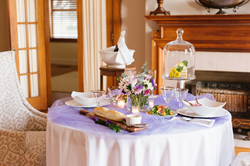 To reserve a dinner for two at the Lynn Plantation Home and to inquire more about the plantation’s history, email Lynn Plantation Events at lynnplantationevents(at)gmail.com or visit their Facebook page at http://www.facebook.com/lynnplantationevents. For more information on memorable experiences in North Louisiana on the Boom or Bust Byway, visit http://www.BoomOrBustByway.com.